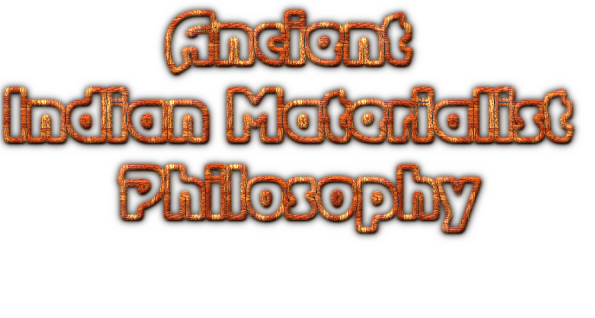 “Materialism” metaphysically denotes that system of thought which refuses to recognize, as the source of the created manifold, a First Cause other and higher than the mere working out of the forces and tendencies inherent in the non-sentient matter qua matter, unsupervised by any non­material power or principle like the Atman or the Deity. And as a consequence it recognizes for the human being no ethical goal higher than a life of pleasure or happiness to the end of his period. 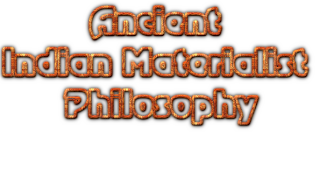 Materialism is accordingly a tendency of thinking which can appear almost at any stage of social or religio­philosophical evolution; and as we saw (See: Chapter Third: Transition from the Brahmana to the Upanishad Period), even the Rigveda is not without it. But from a mere tendency it can develop into a regular system of thought, as it apparently seems to have done towards the end of the Upanishadic period. As forerunners of it we already meet in the earlier Upanishads those Elemental Cosmologies with Water or Ether as the First Principle, from which, the texts* tell us, all the creation was produced; and that this First Principle might not be a sort of an eternal self-subsistent entity, it was actually conceived of as the Asat or non-existing. Chhandogya vi. 2. 1 mentions (and controverts) a definite set of thinkers who made the world evolve from Non-existence; while at the other end of the process we have, in texts like Chha. viii. 11-12 and Brihad. ii. 4.12, the nega­tivistic conclusions about everything knowable and namable being reduced to non-existence, from the clutches of which Yajnavalkya is almost frantically endeavouring to exclude the “Atman” in those darkly enigmatic stanzas with which he drops the curtain down upon the great "symposium" at the court of Janaka in the third Chapter of the Brihadaranyaka., - stanzas which distinctly foreshadow the "Ajati-vada" or the acosmic absolutism of Gaudapada. - For an Upanishadic expression of "Materialism" on the ethical side we have to turn to Chha. viii. 8. 4, where a powerful body of Epicurean non-believers is in­troduced under the opprobrious nickname of the "Asuras." The Upanishads of course were not by themselves expected to go out of their way and detail the tenets of these "Materialistic" systems, which later claimed as their founder no less a name than that of Brihaspati, the Teacher of the Gods. * But the animus which the Bhagavad-Gita shows towards them in Chapter xvi of the poem, as also the several "heretic" doctrines strongly tinged with "Atheism" and "Materialism" that came to be preached in the pre-Buddhistic period, may be safely taken as evidence for the existence, outside the "orthodox" circle of Upanishadic speculation, of a definite school of philosophy for the apostles of which the Maitrayani Up. uses such select epithets as "unheavenly," "robbers," and the like. It is also worth noting here that certain tendencies of Upanishadic speculation such as (1) the denial of Atman's liability and power of doing or suffer­ing anything ( p. 399), and (2) insistence upon the inexorable character of the Law of Karman as revealed by Yajnavalkya to Artabhaga (Brihad. iii. 13, and elsewhere ) - which are both jointly capable of a one-sided development towards passive fatalism - as also (3) belief in the impermanence and mutability of things of which Brihadratha in Maitra. i. 3-4 gives perhaps, if not the earliest, at any rate the most pathetic, expression on the Brahmanic side, together with (4) the doctrine of the unknow­ability of the Real in which Upanishadic philosophy in its most transcendent flights culminated, may have conceivably accentuated the move towards philosophical Materialism and Agnosticism, of which the next age is to afford us such a be­wildering array of illustrations.